Do you have a surgical operation planned in the near future? It is natural to be a little worried about how well the surgery will go or how long your recovery period may be. Many people participate in physical therapy treatments after surgery as part of their recovery plan, which is undeniably helpful for the healing process. However, there are also several benefits to completing a pre-surgical rehabilitation plan, before you even go under the knife. Contact Partners in Physical Therapy today to find out how our pre-hab services can help you with your surgical procedure and recovery. What exactly is pre-surgical rehabilitation? 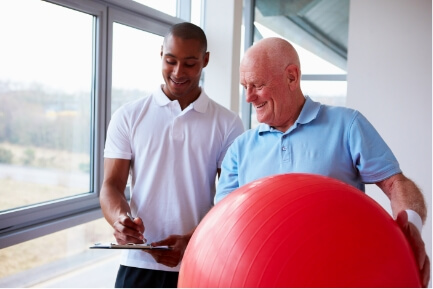 Pre-surgical rehabilitation, also referred to as pre-hab, is becoming an increasingly recommended practice by surgeons, as it can improve the outcomes for their patients. Studies have shown that beginning physical therapy a month or so before a surgery can significantly speed up your recovery time. It is no secret that the preparation for surgery can leave you feeling anxious, but a pre-hab program may be able to put your mind at ease. A pre-surgical rehabilitation plan will help you get physically and mentally prepared for your upcoming procedure. Surgery can take a traumatic toll on your body; therefore, it is typically only performed when there are no other options available. According to the National Institutes of Health, participating in exercise therapies prior to surgery can exceptionally improve your post-operative outcomes and reduce your recovery time. Pre-hab helps improve strength and promote pain relief before surgery, as it prepares your body for the procedure. It can also help you prepare mentally, by encouraging an overall sense of wellbeing. Pre-hab helps to improve your range of motion and patterns of movement with exercises that you can perform before and after your surgery, in order to speed up your recovery time. In general, physical therapy will assist you in improving your physical health and promoting general wellness. Reduces pain. No matter what your surgery may be for, our physical therapist can help reduce your pain through pre-hab. This can be done through a variety of methods, including exercise, massage, or ice and heat therapies. Improves outcomes. The American Physical Therapy Association (APTA) states that pre-hab can improve the overall outcomes of surgery, and can even help in saving money if everything goes smoothly. The stronger you are before the surgery, the more likely the surgery will be successful. Reduces complications. Physical therapy treatments, especially those incorporating exercise programs, can help increase your strength and endurance. As a result, this can improve your immunity, meaning that the chance of infection after surgery will be much less likely. Increases stamina. Whatever surgery you may need, there will always be a loss of strength following the procedure. However, pre-hab can help in reducing how much strength is lost by increasing your stamina before the operation. Engaging in a physical routine before surgery will improve your overall stamina and make the surgery much easier. Shortens recovery. By completing a pre-hab program before your surgery, your recovery should go much smoother than it would without physical therapy treatments. Having strong and toned muscles before surgery helps you get back to your regular routine much quicker. Gives the possibility of avoiding surgery. If your pre-hab treatments work well in improving your pain and overall condition, it may be possible to avoid surgery altogether. While it is not always a common case, some patients found that their pre-hab treatments did wonders, and were sufficient enough in reducing their pain that they canceled their procedure. If your condition begins to improve considerably after starting physical therapy, you’ll want to consult with your physician regarding future treatment options and the possiblility of avoiding the knife. Pre-surgical rehabilitation has been known to provide a number of benefits for surgical patients. By consulting with one of our physical therapists, you can find out what treatment plan will be best for you to achieve optimum results. When you are as strong, flexible, and healthy as possible, you are able to regain normal function much quicker, following surgery. Starting a pre-hab program also means you’ll be able to establish a positive training routine that you will already be accustomed to before your surgery, and that you can take into your recovery for a better outcome. If you are planning on having surgery, contact Partners in Physical Therapy today at Lake Charles, LA center to speak with one of our qualified team members. Our physical therapy practice is dedicated to providing you with the best treatment options available. For the best results, it’s important to get started as soon as possible. Schedule your appointment today to prepare for an easier procedure and recovery period.